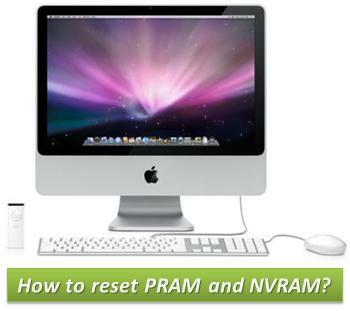 How to Reset PRAM and NVRAM in MAC? Have you heard of PRAM and NVRAM in MAC? No, then PRAM is A Parallel Random Access Machine (PRAM) is a shared memory abstract machine which is used by parallel algorithms to estimate the algorithm performance. It is specially used by designers whereas NVRAM stands for Non Volatile Random Access Memory which remembers the critical information when a PC is shut down. 1. First, shut down your MAC. 2. Then, locate the keys “Command”, Letter ”P” and also “R” as you will need to press these keys in procedural step 4. 3. Now, turn on your MAC. 4. After switching on your MAC, press and hold the keys “Command”, “P” and ”R” till a grey screen appears. 5. Now, hold the keys till the computer restarts and hear the beep start up sound for second time. 6. After hearing the beep sound, now Release the keys and you are done with resetting the PRAM and NVRAM. Your computer’s PRAM and the NVRAM are reset to the default values. PRAM stores Critical information like Status of Apple Talk, Serial Port Configuration and Port definition, Alarm clock setting, Application font, Serial printer location, Auto key rate, Auto key delay, Speaker volume, Attention (beep) sound, Double-click time, Caret blink time (insertion point rate), Mouse scaling (mouse speed), Start up disk, Menu blink count, Monitor depth, 32-bit addressing, Virtual memory, RAM disk and Disk cache. Clearing the PRAM might reset all the above mentioned parameters or some of those. Resetting would lead to re configuration of all the parameters. That is so out of mind though, never thought about this earlier great that you brought in to our notice with a nice tutorials which is explained with ease.